Interest in monitoring severe weather events is cautiously increasing because of the numerous disasters that happen in the recent years in many world countries. Although to predict the trend of precipitation is a difficult task, there are many approaches exist using time series analysis and machine learning techniques to provide an alternative way to reduce impact of flood cause by heavy precipitation event. 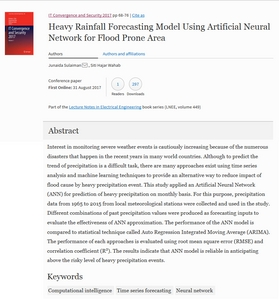 This study applied an Artificial Neural Network (ANN) for prediction of heavy precipitation on monthly basis. For this purpose, precipitation data from 1965 to 2015 from local meteorological stations were collected and used in the study. Different combinations of past precipitation values were produced as forecasting inputs to evaluate the effectiveness of ANN approximation. The performance of the ANN model is compared to statistical technique called Auto Regression Integrated Moving Average (ARIMA). The performance of each approaches is evaluated using root mean square error (RMSE) and correlation coefficient (R 2 ). 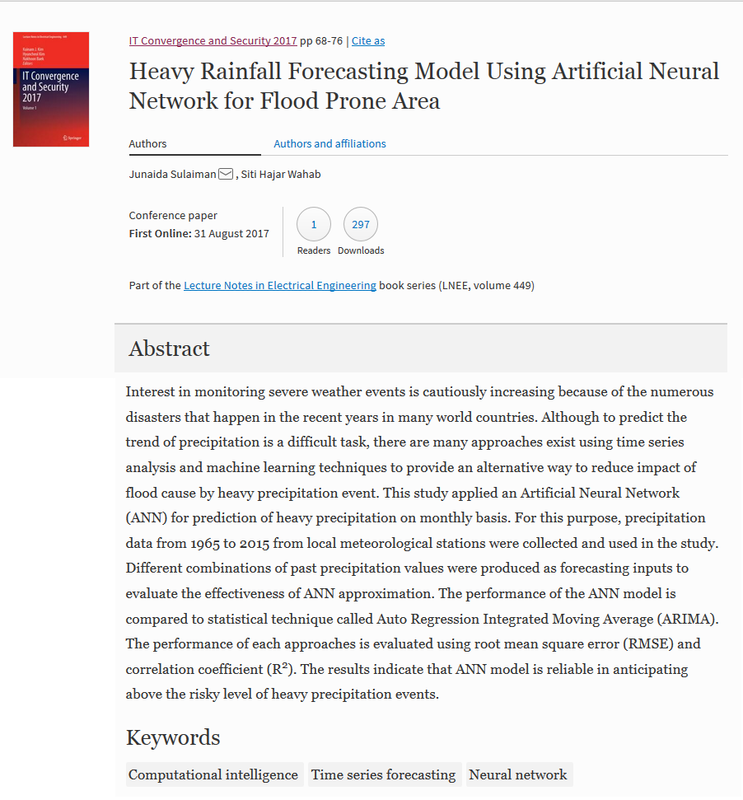 The results indicate that ANN model is reliable in anticipating above the risky level of heavy precipitation events.